Part 2 of the Starting Up and Breaking Down series. What had started as an introductory note has ended up as a separate post. It probably serves as a useful preface for the series, which gets out there in one go why I am taking the approach I am with regard to talking openly about the problems I face. Honesty about one’s mental health, and the extent of the effects when one’s mental health is poor, can be quite unsettling. I’m just starting out in business. At the moment it’s not the kind of business that burns through cash. But at some point, not too far from now, I will probably need to approach investors. And they will all be able to see everything laid out and easy to find online. 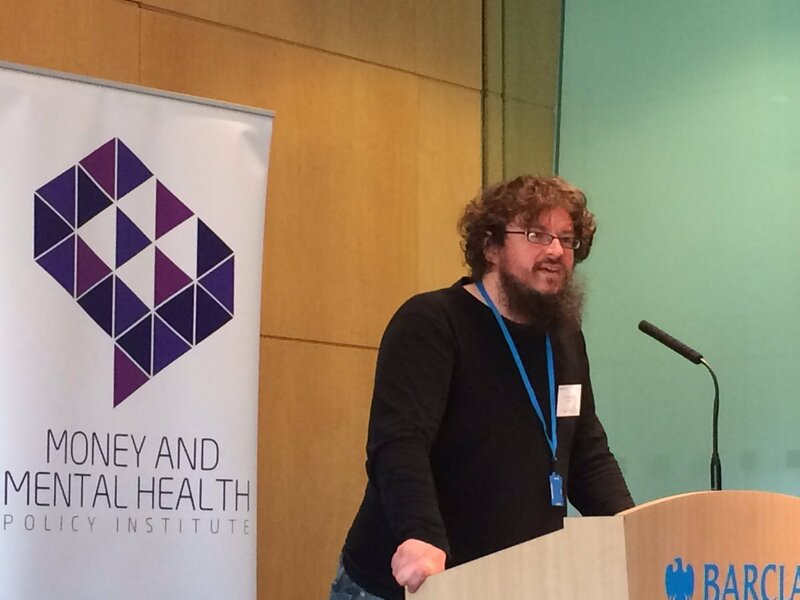 Talking at the launch of the Money and Mental Health Policy Institute’s Seeing Through the Fog. Essentially that means talking about all the ways in which I might struggle with organisation and efficiency for an audience that values just those things. It means talking about mental ill health at all in front of people whose maxims and mantras suggest they see illness as weakness, that they believe an inability to behave according to certain conventions can only result from laziness or obstinacy. These are people who, from the outside at least, hold power over us, who know it, and can make us dance to their tune to give us the oxygen we need. Only, of course, often we can’t do that dance. There are things I find impossible that for many others are “the easy stuff” – from telephone conversations to socialising, to a lot of day to day administration. On the other hand, I can stand in front of 500 people and hold their attention; I can see glitches in somebody’s strategy that no one else can and help fix them; I can fully understand problems, take in information at rates beyond most people I’ve met, and write papers for pretty much any audience. One side does not exclude the other. I imagine I am not alone in having such uneven skills. I am very much hoping that what I uncover on this journey is two things. First, a world of investors, customers, service providers and financiers who do not conform to these stereotypes, who see the actual potential for a business that does things differently but through that different way can produce results that are just as good. And second, where the stereotypes exist, I would like to show that however differently I do things as a result of my disability, not only my idea but my ability to bring that idea to life, are undiminished. That by demanding I do things I cannot rather than supporting me they would be denying themselves access to an incredibly exciting and rather large potential portfolio. I often feel that much of what I have achieved has come only by carefully learning what to hide from whom about what happens under the surface. Of course, to some extent everyone has to hide parts of themselves. But for the neurodivergent and those with poor mental health, this can come at a massive cost. The energy levels it takes to keep up such a mask can be utterly destructive. And here’s the key point – keeping this kind of mask reinforces the worst stereotypes. Why should I lie about being bipolar? Why should I pretend I find it anything other than destroying to communicate by telephone, or that I do not feel my whole body hurt when I wear a suit? There are rules we have to play by because they serve a very useful purpose – hiding our very darkest thoughts and impulses are an obvious example, as would be not talking freely and constantly about subjects everyone else in the room finds distressing. But so many of the rules that cause genuine difficulty to those of us who are disabled serve no purpose other than convention. And convention is not an end purpose – it is a useful means of securing an end that really does matter. As such, I think it’s important to challenge this kind of convention – the one that disadvantages us over others (most people don’t feel pain when they wear a suit – “uncomfortable” is NOT painful) for no good reason. I am aware that doing so will arouse ire and displeasure. I want to challenge people to think about that head on. WHY do these things matter? Are they fundamentally good reasons? This is, in fact, one of the biases I tackle on my creative thinking training because it is one that damages people’s and businesses’ potential – it is a bias that assumes “how things have always done” must in some way be “natural” or “the best way” or “he only way they can be done” without stopping to check the control group, the situations where it was done differently, to see how that worked. I see myself in many ways as a control group, my job to show that doing things differently can produce really good results without the world actually ending. Finally, one of the things Rogue Interrobang offers is training around mental health for entrepreneurs. Verity and I have given our training session for managers more than 25 times so far in Oxford, and I will take that experience, a decade of advising government bodies, financial institutions, and regulators, and bring it into my journey through the start-up world to help others facing the same difficulties. If I am going to make the case for the value of the training, then people need to know the reality of my journey. And if past experience is anything to go by, just hearing someone else talking openly can be a help. After that diversion, next time I will say more about what got me to this stage. Expect long-winded and somewhat effusive references to Carl Sagan.